The Transnational Awareness Group (TAG) collects and spreads information about the way companies contribute to armed conflicts. Initiated in Belgium by Vredesactie (Peace Action), this form of action - to track, expose and label war businesses - is now spreading internationally. TAG war consists of a pool of inspectors and several TagTeams. They intervene at the site of production or services contributing to violent conflict. Using their WARTAG logo, TAG teams 'brand' war profiteers and their profiteers, and compile information in a database www.tagwar.eu. Vredesactie wants to encourage groups in other countries to join the Economy@War campaign, offers support in setting up TAG teams and actions in other countries, and invites more groups to contribute to the tagwar website. Through its Economy@War campaign, Vredesactie highlights the economic forces driving towards for war, and works to develop a peace economy. Companies worldwide contribute to the escalation of violent conflicts by producing and supplying weapons. Governments fail to curb this trade or are themselves directly involved. TAG fills this gap in terms of control of war trade, and TAG's mission is to reveal the complicity of companies in war business. War business knows no boundaries, so TAG needs to operate freely throughout the world. In November 2009. OIP - the Belgian company producing night vision goggles and weapon sights - received unexpected visitors from TAG. Inspectors arrived at the company's premises to verify information about complicity in warcrimes. They were specifically concerned about arms sales to controversial countries like Colombia and Israel and asked to meet the management in order to discuss these. OIP refused, but a couple of inspectors managed to do a short inspection anyway, by just walking into the building to have a look behind the scenes. The inspectors decided there were enough indications of warprofiteering. They called in their colleagues from the TAG Action Team, who promptly tagged OIP with WARTAG logos and banners. They replaced the company's flag with one of their own. OIP is a subsidiary of Elbit Systems, a global corporation based in Israel and closely involved with the Israeli military establishment. Elbit's products are crucial for the illegal activities of the Israeli Defence Forces. The second target of a TAG intervention was Caterpillar. The TAG team inspected Caterpillar’s production site in Charleroi, Belgium. The inspectors visited the company in order to verify information about Caterpillar’s involvement in warcrimes. The company allegedly supports the Israeli military by providing them with bulldozers and other machinery used in the demolition of Palestinians’ houses and in the construction of the separation wall and settlements on Palestinian land. The TAG inspectors entered the heavily secured production site in Charleroi in order to interview personnel and to take footage of the bulldozers and components in the factory. They were met with suspicion, followed around by security personnel and eventually arrested. Vredesactie is a radical peace organisation advocating a society in which conflicts are solved without violence or the threat of it. Vredesactie works through different campaigns of nonviolent action. Its actions to stop trains carrying military equipment through Belgium exposed the direct cooperation of Belgium in the military intervention in Iraq. Through Vredesactie's nonviolent action training, hundreds of people have learned how to intervene in a nonviolent and direct way. 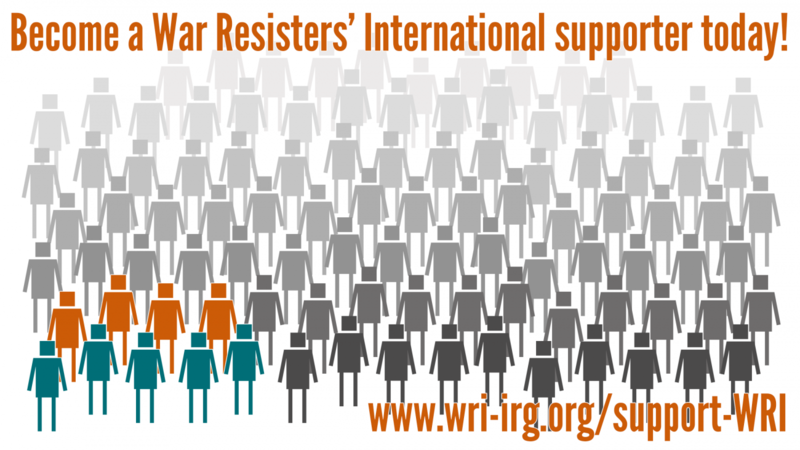 As a member organisation of WRI, Vredesactie aims to achieve peace through nonviolent means. It promotes pacifism as the opposite of passivity and helplessness - rather it is the nonviolent and purposeful pursuit of a more peaceful and just society.